After completing high school, Nadege attended a community college in Jacksonville, Florida, and earned an associate of arts degree in business administration. 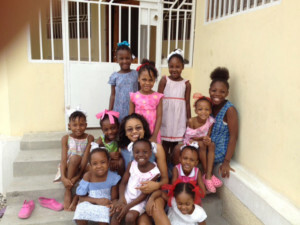 After graduation she returned to Haiti to work for Haiti Outreach Ministries as principal of the school. After studying and spending time in the United States, Nadege realized the importance of reading, so starting a library at the school became a priority. A school library is a rarity in Haiti and the children really enjoy reading and browsing the selection. Nadege also serves in a variety of ways including aiding the school nurse when needed, overseeing an educational theatre, and being the on-site sponsorship coordinator for teams visiting Haiti. After the terrible earthquake on January 12, 2010, a US church wanted to help with providing a place for newly orphaned children to live. Nadege knew of many families whose children now needed a home and was integral in the creation of House of Hope orphanage. Located near Blanchard, it is now home for eleven girls who attend school nearby. In the fall of 2013, Nadege came to Salem College to complete her bachelor’s degree in business administration through the Fleer Center. After completing her degree, she returned to the school in Haiti she was principal of prior to coming to Salem. Read the full Forsyth Woman story here.